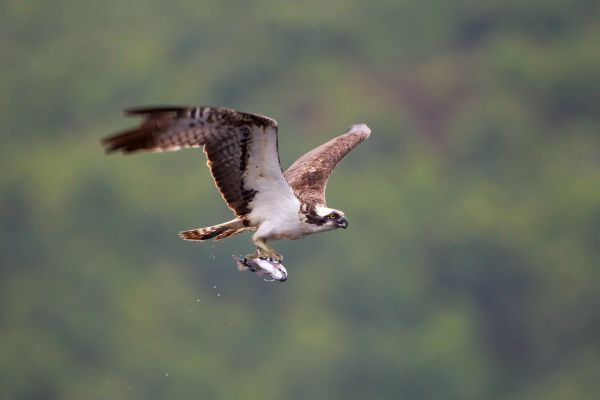 As wildlife lovers in the region have their eyes to the skies eagerly awaiting the return of the Kielder osprey, Osprey Watch is also winging its way back! As with previous years, Northumberland Wildlife Trust will be running Osprey Watch from its cabin behind the Boat Inn at Kielder Waterside between 10.30am - 5:00pm every Saturday, Sunday, Bank Holiday Mondays (and extra Wednesdays in July and August) from Saturday 20th April until Sunday 18th August. Breeding pairs of ospreys have nested in Kielder between March and September since 2009, with activity on the nest tending to be mainly throughout July and August as the chicks hatch, are fed and then learn to fly and hunt. Osprey Watch is a great way to find out more about a wonderful bird that is found in temperate and tropical regions of all continents. The Watch is delivered almost entirely by volunteers and is a great way to meet new people and experience the wonderful Kielder landscape. Anybody wanting to join the wonderful Osprey Watch team of volunteers can register at www.nwt.org.uk/get-involved/volunteer to register their interest. No previous experience is required as a training day will be held at Kielder on Thursday 14 March prior to the season starting - to secure a place visit www.nwt.org.uk/get-involved/volunteer New volunteers will always be in the company of experienced volunteers who will be on hand to assist. The Kielder Osprey Project is a partnership between Kielder Water & Forest Park Development Trust, Forestry Commission, Northumberland Wildlife Trust, Northumbrian Water and Calvert Trust Kielder.